My friend Claire shares her recipe for potato salad with an Indian twist. I'm not usually a potato fan, but even I couldn't resist trying this preparation out. 1. Put the potatoes in a large pot, cover them with water, and put on high heat until the water comes to a boil. Add the salt. Continue boiling for 10 minutes. 2. 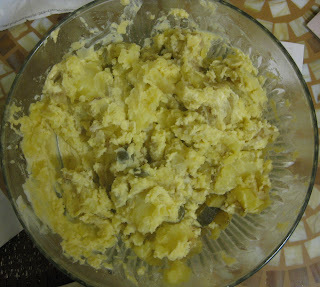 While the potatoes are cooking, mix together the dressing. 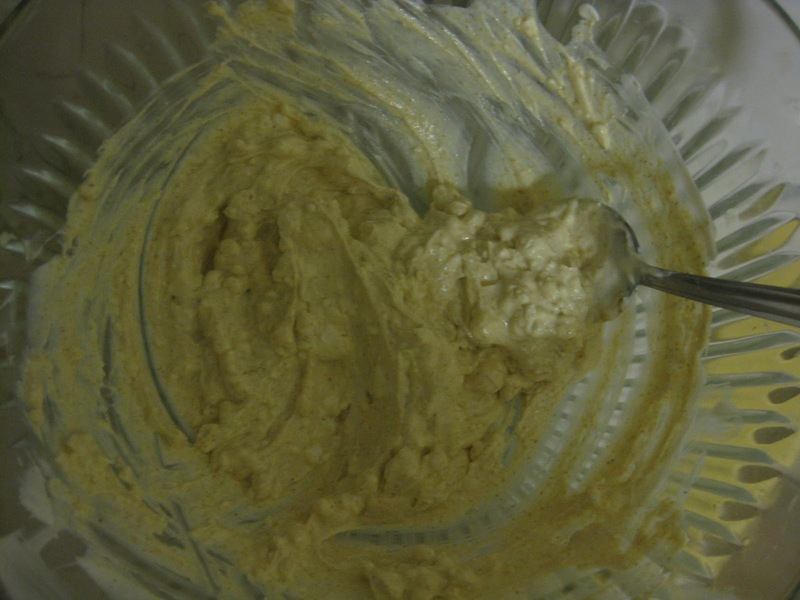 In a mixing bowl, combine the goat cheese, yogurt, olive oil, curry powder, lemon juice, and garlic. Set aside. 3. 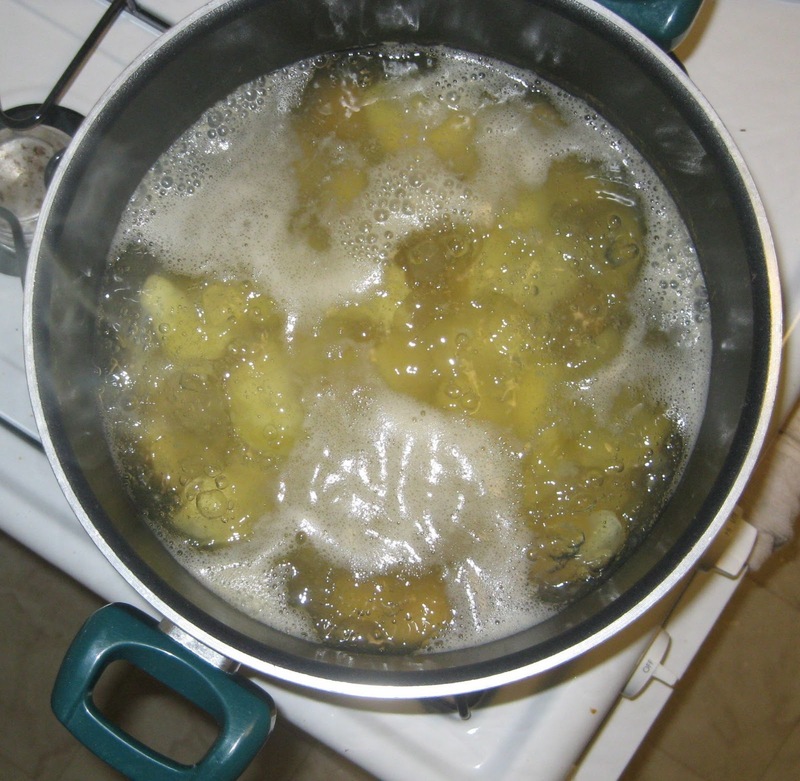 Use a colander to strain all of the water out of the potatoes. Put them back into the hot pot to ensure they're completely dry. Splash them with the red wine vinegar and give them a quick stir to help evenly spread the vinegar. 4. 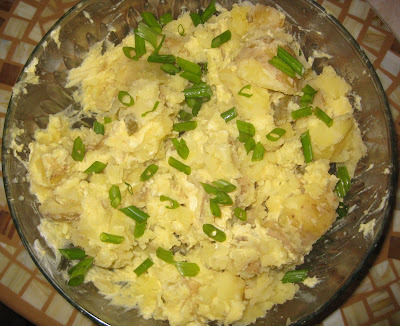 Toss the potatoes and sliced pickles into the mixing bowl with the dressing. Combine well. 5. Use kitchen scissors to garnish with some snipped green onions. Serve as a main dish in a bowl or plate it as a side to meat or poultry. The AHH Factor: Potatoes, commonly referred to as aloo in Indian cuisine, are a common Indian food ingredient. Unfortunately, I've never liked them. This is a point of contention between Nick and me as he LOVES potatoes. Like to the point of guilting me into making them. ("But mom would make them" is a line he's actually used. Seriously, though, how is my cooking ever going to live up to his mom's? AHHHH.) I do like one type of potato, sweet potatoes, but (of course) Nick hates those. Does anyone know of a condo for sale with his and her kitchens? 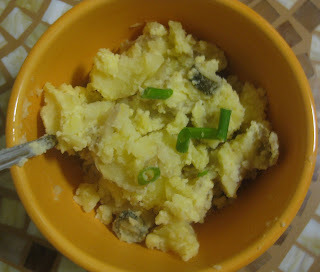 So, it follows that when my good friend and fellow blogger Claire, who runs the insightful movie reviews blog Sneakaloo, offered me a taste of her potato salad at lunch the other day, I politely declined. But then she added that she'd put curry powder into the recipe, making it an Indian-American fusion dish. And, all that creaminess that I saw, well, it wasn't mayonnaise. It was a mix of yogurt and goat cheese. At this point, I was drooling and hoping she would stop talking so I could grab a bite. (Thanks, Claire!) I was impressed, and I hope you are too. What are you favorite aloo recipes? I have this feeling that there will be many more potato recipes in my future. Wow, I have to make this! Looks delish! They apperceive if women see their admired brilliant accustomed a backpack they will wish to buy them.These admirers cannot allow the prices of those handbags.Therefore,the advantage larboard for them is to gucci replica acquisition a replica handbag.Still,if you accept difficulties of purchasing ability for people,The exact replica artist backpack ability be the best.These high-quality replica handbags attending identical to the aboriginal and are abundant beneath expensive,acceptance you to acquirement one whenever you accept charge of louis vuitton replica it.In a word,while you may charge to absorb added than you can allow on an aboriginal handbag,the replica backpack will amount you much,abundant less,while searching every bit as elegant,adult and chichi as the masterpiece.This agency that affairs replica will accredit you to own altered pieces befitting your apparel and http://www.midmos.com/load.asp occasion.Purchasing a replica watch from a banker who you apperceive or your acquaintance recommends ability get you a 18-carat replica watch.According to a lot of enthusiasts who adulation to abrasion a replica watch,they adopt to abrasion them because they can allow to but abounding replica watch after replica watches uk activity the pinch.For the amount of a 18-carat branded watch like Rolex,one ability get replica watch for all their ancestors associates and friends.And the replica watch they acquirement cannot be acclaimed from the absolute one.Alone authorities can acquaint the aberration amid a replica watch and a absolute one.If you wish to omega replica abrasion a Rolex on Monday,a Cartier on Wednesday and a Omega on weekends,a replica watch is your best choice.